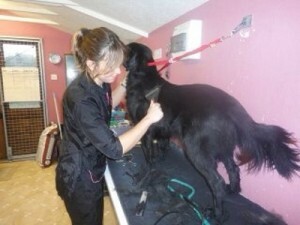 The Grooming Parlour offers a full grooming service for both dogs and cats. Our purpose-built parlour incorporates modern, high quality equipment to enable us to provide the best quality grooming service for your pet. We use the finest range of professional products to suit your pet’s skin and coat. We also offer a range of home grooming products to b uy so you can maintain your pet’s coat in between visits. The Grooming Parlour is owned and run by Becky Wood. Becky received her Diploma in ‘All Breeds and Poodle Grooming’ from The Oxford Grooming School in October 1999 and while working alongside her mother Sue, who at the time provided the grooming service at the kennels, she started her own mobile dog grooming business which she continued to run very successfully until the birth of her son in 2007. Sue retired from the grooming side of the business later that year and Becky took over; establishing The Grooming Parlour on the kennel site – Becky finds that having a permanent grooming parlour makes it easier to juggle family and work. She is trained in cat and dog first aid and regularly attends grooming seminars and events to learn new ideas and provide modern grooming services to customers. Becky She has 3 dogs of her own – Queen Ewok, Banana Muffin, and Purdey, plus a cat called Binks.